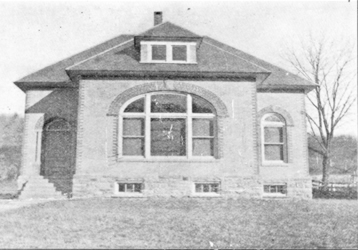 The Daniel Pierce Library received its provisional charter in 1898 and its absolute charter in 1907. The provisional charter was signed by Melvil Dewey who was then the Secretary of the University of the State of New York. The Library was founded by Daniel Pierce, a native son. He was born and raised in the Town of Neversink and later settled in the state of Illinois where he prospered in the fields of real estate and finance. Upon returning to Grahamsville later in his life, Daniel Pierce expressed gratitude to the town of his birth by financing the foundation of a library with a donation of $300.00. The first two books purchased by the library were Westward Ho and The Scarlet Letter—at an astounding 32 cents each! The current historical structure, a pleasantly comfortable home-like building with its golden stone face and three original fireplaces, was built in 1902 at a cost of $3,100.00. More than 100 years later, the library continues to be a community center and meeting place. Several community groups meet on a regular basis, and broad cross-section of people in the community avail themselves of library resources. People of all ages regularly utilize library facilities, ranging from babies enrolled in “Mother Goose Time” to senior citizens who are developing their computer skills. During the school year, preschool programs are offered, including a partnership with Tri-Valley Central School to service the children enrolled in the Universal Pre-Kindergarten programs. Except for a small addition in the 1980’s, the library continued to operate from its original quarters. In spite of this, circulation and holdings increased significantly over the years. Our library was literally at the bursting point, when in 2002, the Board of Trustees decided to explore the possibility of adding to the existing historical structure. After approaching representatives of Tri-Valley School, the Town Boards within the library’s service area, local businesses, and patrons, it became surprisingly clear that the community would indeed not only support such an endeavor – but would literally help to build it. The Board of Trustees decided to embark upon an extensive Building Campaign to raise the funds needed for the endeavor. A Building Committee was formed and chaired by Philip Coombe, Jr., former Commissioner of Corrections for the State of New York. Building plans were developed, drawn, and revisited numerous times to create a blueprint for a library addition that would meet the needs of the population as it changes and grows over the years to come. The Daniel Pierce Library’s Building Committee broke ground in May of 2004. Now, several years later, the Daniel Pierce Library’s 23,500 square-foot addition houses the Time and the Valley’s Museum and a Children’s Literacy Center, as well as a reading room, computer learning stations and community meeting rooms. The Library provides a comfortable atmosphere for patrons with a state-of-the art geothermal heating and cooling system, which takes advantage of the abundance of water under the property and to conserve fossil fuels. Improved access for disabled and elderly patrons, adequate parking and outside lighting are also features of the addition. Shelf space for an additional 40,000 books, audio books, periodicals, videos, DVDs, and CD-ROMs has been provided to meet the needs of the community. Charles Dickens is quoted as saying “The whole difference between construction and creation is exactly this: that a thing constructed can only be loved after it is constructed; but a thing created is loved before it exists.” The Daniel Pierce Library, with its aging, golden-bricked façade, voile-papered walls, and charming fireplaces, contains so much more than books. It is a center of learning, a place where patrons come first, children meet their first friends, and volunteers are cherished beyond words. Certainly, without the incredible outpouring of generous support from the members of our community and local contractors and businesses, building a Library of this magnitude would have been impossible. Together, we will carry on our enduring mission of “celebrating the past and building for the future” by developing programming and resources that will improve literacy, support education and career readiness, and nurture family and community-building activities. In addition to providing access to thousands of books, audio books, CDs, and DVDs, the Daniel Pierce Library offers free high-speed internet access; computer instruction; reading programs; writing workshops; cooking, art, and craft classes; concerts, and much more. For more information, please stop by to visit or contact us at 845-985-7233.